I had a great time visiting Edinburgh, Scotland this week. I’m thankful to have the opportunity to keynote at LinuxCon Europe 2013. 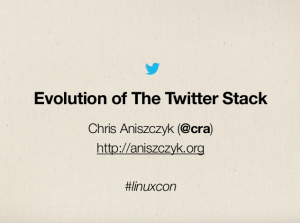 I took the time to talk about the evolution of the Twitter Stack over the years and how we moved to the JVM. I also discussed the importance of open source in that transition and how we give back since participating in open source isn’t a zero sum game.